French President Emmanuel Macron has committed to rebuilding Notre-Dame Cathedral within five years, just a day after a fire gutted the cathedral. "We will rebuild Notre-Dame even more beautifully and I want it to be completed in five years. We can do it," Macron said Tuesday in a television address to the nation. "It is up to us to change this disaster into an opportunity to come together, having deeply reflected on what we have been and what we have to be and become better than we are. It is up to us to find the thread of our national project." Firefighters in Paris declared success Tuesday morning in a more than 12-hour battle to extinguish an inferno that engulfed the iconic Notre-Dame Cathedral on Monday evening. However, French Interior Minister Christophe Castaner said there are still some risks that may endanger the structure. 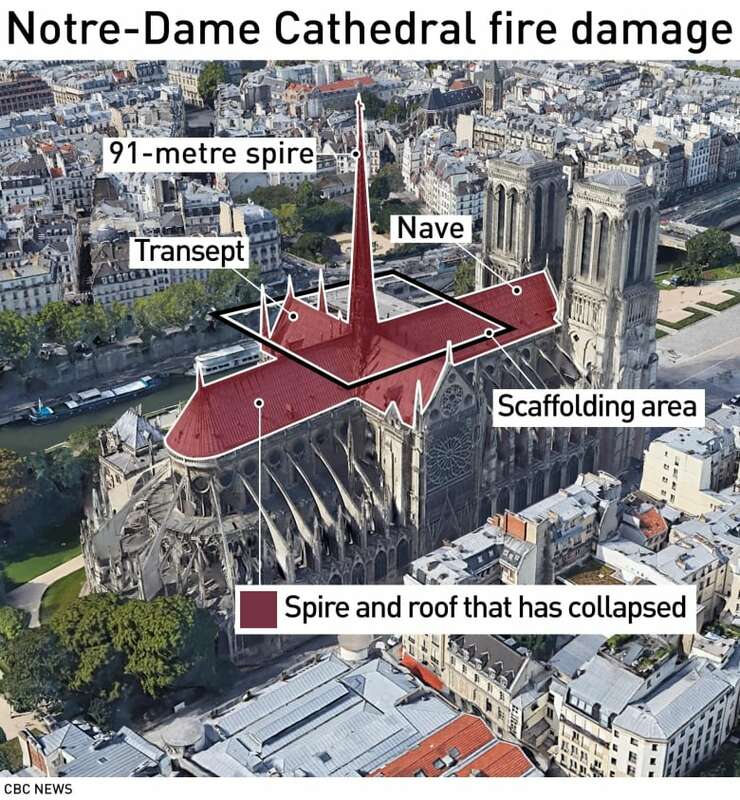 The two 69-metre bell towers remained intact but the cathedral's spire and roof were destroyed in the fire. He added that state employees will need to wait 48 hours before being able to safely enter the cathedral and take care of the artworks that are still there. Some were too big to be transferred. "We will be standing at [Notre-Dame's] bedside," Castaner said. Images broadcast Tuesday by French news channel BFM TV showed several pieces of wooden furniture, including chairs and benches, seemingly intact, but there is a gaping hole in the nave's roof, with a pile of burnt debris lying underneath. Many tiles and columns were spared from the worst of the fire. The French Bishops Conference said that the bells of all cathedrals across the country will ring on Wednesday at 6:50 p.m. local time (12:50 p.m. ET), the time when the fire started Monday. The Bishops Conference said Tuesday in a statement that this will show the solidarity of all dioceses toward Paris and that the fire at Notre-Dame Cathedral "is a shock that affects far beyond just the Catholics of our country." Authorities believe the fire started accidentally, possibly as a result of restoration work at the global architectural treasure that survived almost 900 years of tumultuous French history but was devastated in the blaze on the second day of Holy Week. Paris prosecutor Rémy Heitz said there's no evidence of arson and he expects the investigation will be "long and complex." Heitz said an initial fire alert was sounded at 6:20 p.m. Monday but no fire was found. The second alert was sounded at 6:43 p.m., and fire was discovered on the roof. He said Tuesday that 50 investigators were working on the probe. He said they will be interviewing workers from five companies who had been hired to work on renovations to the cathedral's roof, which was being repaired before the fire and which is where the flames first broke out. Investigators have already questioned nearly 30 people, said a Paris police official, speaking on condition of anonymity in order to comment on an ongoing probe. French insurance firm AXA said on Tuesday it provided insurance coverage for two of the contracting firms that were working on the restoration project. The fire swiftly ripped through the cathedral's oak roof supports, where workers had been carrying out extensive renovations to the spire's timber-framed supports. In a statement released on Tuesday, AXA said its staff were fully collaborating with the investigators. An AXA spokesperson declined to estimate the company's potential liabilities associated with the damage. News that the fire was probably accidental has done nothing to ease the national mourning for the symbol of national pride immortalized in Victor Hugo's 1831 novel The Hunchback of Notre-Dame. Artworks that were removed from the cathedral during the blaze will be transferred to the Louvre Museum, according to France's culture minister. The artifacts — which include relics such as the Crown of Thorns believed in the Christian faith to have been worn by Jesus Christ when he was crucified, and French king St. Louis's 13th-century tunic — were first moved to the city town hall, Franck Riester told reporters. As well, Paris's deputy mayor said Notre-Dame's organ, among the world's biggest and most famous, remains intact. The impressive organ dates to the 1730s and was constructed by François Thierry. It boasts an estimated 8,000 pipes. Emmanuel Gregoire told BFM TV Tuesday that a plan to protect Notre-Dame's treasures was rapidly and successfully activated. Gregoire also described "enormous relief" at the salvaging of pieces such as the purported Crown of Christ. Laurent Prades, Notre-Dame's heritage director, told The Associated Press that only one piece of architecture inside the sacred building was damaged. The high altar, which was installed in 1989, was hit and harmed by the cathedral's spire when it crashed down in the flames. "We have been able to salvage all the rest," said Prades, who witnessed the recovery overnight. 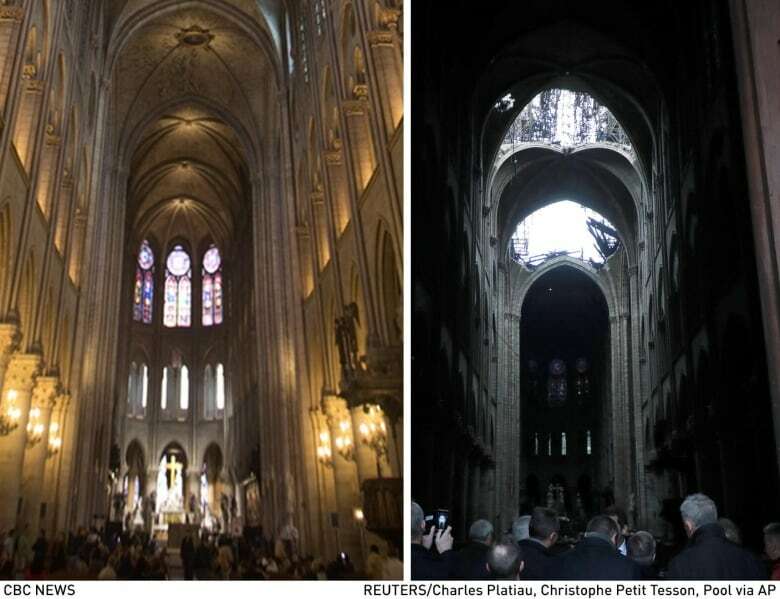 These images taken inside Notre-Dame Cathedral before, left, and after the fire show the extent of the damage. Among the most famous elements inside the cathedral, the three large stained-glass rose windows have not been destroyed, Prades said, though they may have been damaged by the heat and will be assessed by an expert. In appealing for help to rebuild the cathedral, Macron described it as "a part of us" and appealed for help to do so. As the country woke up in collective sadness, its richest businessman, Bernard Arnault, and his luxury goods group LVMH, answered this call with a pledge of €200 million (more than $300 million Cdn). A statement said the Arnault family were "in solidarity with this national tragedy, and join in the reconstruction of this extraordinary cathedral, a symbol of France, of its heritage and togetherness." Businessman François-Henri Pinault and his billionaire father François Pinault also said they were immediately giving €100 million (more than $150 million Cdn) from their company, Artemis, to help finance repairs. François-Henri Pinault said in a statement, "This tragedy impacts all French people" and "everyone wants to restore life as quickly as possible to this jewel of our heritage." Patrick Pouyanne, chief executive officer of French oil and gas company Total, said the multinational will make a contribution of €100 million to the reconstruction efforts. French luxury and cosmetics group L'Oreal, along with the Bettencourt Meyers family and the Bettencourt Schueller foundation, said they would donate €200 million in total for repairs. Bouygues construction group CEO Martin Bouygues said he and his brother Olivier would donate €10 million (more than $15 million Cdn). The 12th-century church was home to relics, stained glass and other works of art of incalculable value, and is a leading tourist attraction. Pope Francis said on Tuesday that he shared the sadness of the French people mourning the devastation and hoped the cathedral would be restored to remain a symbol of the faith of their forebears. Francis phoned Macron to express his solidarity, hours after the Vatican culture minister offered art experts who could advise on reconstruction efforts.The Vatican's culture minister said the Holy See is willing to offer technical restoration know-how to help rebuild and restore the devastated cathedral. "This disaster seriously damaged a historic building. But I realize that it has also affected a national symbol dear to the hearts of Parisians and French in the diversity of their convictions," Francis said in a message to the archbishop of Paris, Michel Aupetit. The Queen also sent Macron a message of commiseration. "Prince Philip and I have been deeply saddened to see the images of the fire which has engulfed Notre-Dame Cathedral," her message said. Elizabeth's oldest son, Prince Charles, the heir to the throne, said he too was "utterly heartbroken" to learn of the fire. The devastation was a blow to all of Europe, and all Europe will contribute to its rebuilding, leaders of the European Union declared on Tuesday at the European Parliament in Strasbourg, France. "Europe has been wounded. France has been wounded. Paris has been wounded," European Commission President Jean-Claude Juncker told lawmakers, promising EU "solidarity." EU chief Donald Tusk called on the bloc's member countries to help France rebuild, saying the site in Paris is a symbol of what binds Europe together. 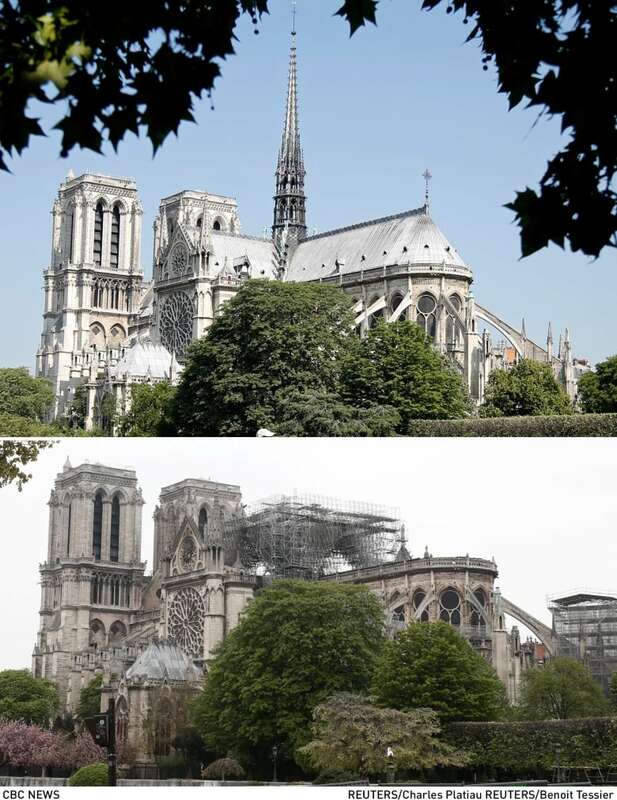 These images show the exterior of Notre-Dame Cathedral before, top, and after the fire that engulfed the iconic church on Monday. "At stake here is something more than just material help," Tusk said. "The burning of the Notre-Dame Cathedral has again made us aware that we are bound by something more important and more profound than treaties." Parliament President Antonio Tajani invited EU lawmakers to contribute their day's salary to help finance reconstruction. Meanwhile, Macron's European election campaign was suspended for now following the fire, said French politician Nathalie Loiseau, who is spearheading the campaign. Macron will hold a cabinet meeting Wednesday dedicated to the aftermath of the fire. The French presidency said a morning session will be followed by one in the afternoon focusing on the national fundraising campaign and the reconstruction work.